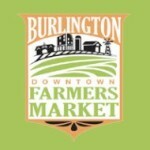 Burlington’s Downtown Farmers Market is a farmer-run, producers-only market for our community. "Local farmers feeding local folks!" Locally-grown fresh produce, including fruits, vegetables, meats, honey, baked goods, natural home products, and much more! Every Sat 8 AM-12 PM behind Company Shops Market (across from the Burlington train station).